Collateral is a 2004 American neo-noir action thriller film directed and produced by Michael Mann, written by Stuart Beattie and starring Tom Cruise and Jamie Foxx. Jada Pinkett Smith, Mark Ruffalo, Peter Berg, Javier Bardem, and Bruce McGill feature in supporting roles. Collateral was released in the United States on August 6, 2004, and grossed $217 million worldwide. The film received positive reviews from critics and was chosen by the National Board of Review as one of the top ten films of 2004. Cruise and Foxx's performances were widely praised, with Foxx being nominated for the Academy Award for Best Supporting Actor; the editors, Jim Miller and Paul Rubell, were nominated for the Academy Award for Best Film Editing. Max Durocher (Jamie Foxx) is a meticulous Los Angeles cab driver trying to earn enough to start his own limousine business. One of the evening's fares is U.S. Justice Department prosecutor Annie Farrell (Jada Pinkett Smith). On the drive to her office, they strike up a conversation and Annie gives Max her business card. Max's next fare is Vincent (Tom Cruise). Apparently impressed by Max's skill at navigating through traffic, Vincent tells Max that he is in Los Angeles for one night to complete a real estate deal, and offers Max $600 to drive him to several locations. Initially reluctant as it is against regulations, Max is eventually persuaded. As Max waits at the first stop, a corpse falls onto his car; Vincent reveals himself as a hitman – the body is one of his five targets. He forces Max to hide the body in the trunk and continue driving. At the second stop, Vincent ties Max to the steering wheel. Max asks a group of young men for help but two of them rob him and take Vincent's briefcase. Returning, Vincent kills them. He then offers to buy Max a drink at a jazz club. At the club, Vincent engages the owner Daniel (Barry Shabaka Henley) in conversation, then unexpectedly kills him in front of Max. Max pleads Vincent to let him go but Vincent threatens to kill him if he refuses to obey. Max's boss, who has been hectoring him over the radio, tells Max his mother Ida (Irma P. Hall) called. Learning of Max's nightly visits to hospital to see his mother, Vincent insists that Max does not break his routine. At the hospital, Ida proudly tells Vincent that Max has his own limousine company, revealing Max has been lying to her. Overwhelmed, Max leaves and dumps Vincent's briefcase onto a freeway. Vincent coerces him to meet drug lord Felix Reyes-Torrena (Javier Bardem) to obtain information on his last two targets. Max, posing as Vincent, acquires the information but Felix orders his men to kill "Vincent" if he does not complete the job. Max heads with Vincent to a nightclub, seeking the next target, Peter Lim. 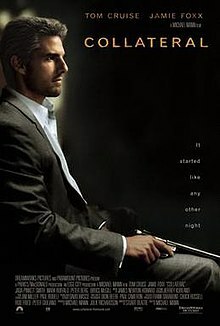 Narcotics detective Ray Fanning (Mark Ruffalo) uncovers a connection between the three victims and reports his finding to FBI agent Frank Pedrosa (Bruce McGill). Pedrosa identifies the victims as witnesses in a federal grand jury indicting Reyes-Torrena the following day. At the nightclub Vincent manages to kill all of Felix's hitmen, Lim's bodyguards and Lim, then leaves the club. Fanning rescues Max and smuggles him outside but is killed by Vincent, who beckons Max back into the cab. Following their getaway, the two trade insulting summaries of each other's life. Vincent mocks Max for his lack of ambition, while Max berates Vincent for his inability to understand other people. Aware that Vincent intends to kill him, Max deliberately crashes the cab but both survive and Vincent escapes. A police officer arrives. Seeing the corpse in the trunk, he tries to arrest Max. However, Max notices Vincent's open laptop, revealing that his final target is Annie. He overpowers the police officer, takes Vincent's gun from the wreck, and rushes toward Annie's office building. Stealing a bystander's phone, Max uses Annie's business card to call and warn her. She is incredulous until Max reveals details about Vincent's previous victims, urging her to call 911. Vincent steals the security guard's gun and uses a fire axe to cut the power and telephone lines on Annie's floor. A tense hunt in the dark ensues. Vincent finds Annie, but is shot and wounded by Max, who escapes with Annie on foot. Vincent pursues the pair onto a metro rail train. Cornered at one end of the train, Max engages Vincent in a shootout. The subway car momentarily goes dark, the pitch darkness rendering Vincent's advantage of marksmanship useless. Vincent, fatally wounded, slumps into a seat, repeating a remark about a man dying unnoticed on a Metro train and asking Max if anyone will notice, before succumbing to his wound. Max and Annie get off at the next station in the dawn of a new day. Tom Cruise as Vincent, a professional hitman hired to kill four witnesses and a prosecutor. Jamie Foxx as Max Durocher, a taxi driver whom Vincent employs to drive him to the locations of the hits. Jada Pinkett Smith as Annie Farrell, the lawyer prosecuting Felix Reyes-Torrena. Mark Ruffalo as Ray Fanning, an LAPD detective on the tail of Vincent and Max. Peter Berg as Richard Weidner, Fanning's partner. Bruce McGill as Frank Pedrosa, an FBI agent staking out Felix Reyes-Torrena's club. Irma P. Hall as Ida Durocher, Max's mother. Barry Shabaka Henley as Daniel Baker, a jazz club owner and one of the witnesses. Steven Kozlowski as leader of the muggers shot dead by Vincent for taking his bag. Klea Scott as Zee, one of Pedrosa's team members. Emilio Rivera as Paco, one of Felix's bodyguards and hitmen. Thomas Rosales, Jr. as Ramon Ayala, a low-level player in the exotic substances business and one of the witnesses. Inmo Yuon as Peter Lim, the owner of the club Fever and one of the witnesses. Angelo Tiffe as Sylvester Clarke, a former criminal attorney who represented Ramone and one of the witnesses. When he was 17 years old, Australian writer Stuart Beattie took a cab home from Sydney airport, and had the idea of a homicidal maniac sitting in the back of a cab with the driver nonchalantly conversing with him, trusting his passenger implicitly. Beattie drafted his idea into a two-page treatment titled "The Last Domino", then later began writing the screenplay. The original story centered around an African-American female cop who witnesses a hit, and the romance between the cab driver and his then librarian girlfriend. The film has limited resemblance to the original treatment. Beattie was waiting tables when he ran into friend Julie Richardson, whom he had met on a UCLA Screenwriting Extension course. Richardson had become a producer, and was searching for projects for Frank Darabont, Rob Fried and Chuck Russell's company Edge City, which was created to make low budget genre movies for HBO. Beattie later pitched her his idea of "The Last Domino." Richardson pitched the idea to Frank Darabont, who brought the team in for a meeting, including Beattie, and set up the project under Edge City. After two drafts, HBO passed on the project. At a general meeting at DreamWorks, with executive Marc Haimes, Beattie mentioned the script. Marc Haimes immediately contacted Richardson, read the script overnight, and DreamWorks put in an offer the following day. Collateral sat on DreamWorks' development books for three years. Mimi Leder was initially attached to direct, it then passed on to Janusz Kamiński. It was not until Russell Crowe became interested in playing Vincent that the project started generating any heat. Crowe brought Michael Mann on board, but the constant delays meant that Crowe left the project. Mann immediately went to Tom Cruise with the idea of him playing the hitman and Adam Sandler as the cab driver. Sandler later dropped out due to scheduling conflicts with Spanglish, and was replaced by Jamie Foxx. Beattie wanted the studio to cast Robert De Niro as Max (once again making him a taxi driver, though the exact opposite of Travis Bickle). However, the studio refused, insisting they wanted a younger actor in the role. Mann chose to use the Viper FilmStream High-Definition Camera to film many of Collateral's scenes, the first such use in a major motion picture. There are many scenes in the film where the use of a digital camera is evident, in particular, scenes where the Los Angeles skyline or landscape is visible in the background. One event of note was the filming of the coyotes running across the road; the low-light capability allowed Mann to spontaneously film the animals that just happened to pass, without having to set up lighting for the shot. Mann had previously used the format for portions of Ali and for his CBS drama Robbery Homicide Division and would later employ the same camera for the filming of Miami Vice. The sequence in the nightclub was shot in 35 mm. Early drafts of Collateral's script set the film in New York City. However, later revisions of the script moved the film's setting to Los Angeles. James Newton Howard composed the score for the film, with additional music by Antônio Pinto. The Collateral soundtrack was released on August 3, 2004, by Hip-O Records. The soundtrack also features the song "Iguazú" written by Gustavo Santaolalla. The film received positive reviews, with particular praise going to Tom Cruise and Jamie Foxx's performances. On the review aggregator Rotten Tomatoes, 86% of critics gave the film positive reviews, based on 226 reviews. The critical consensus states that "Driven by director Michael Mann's trademark visuals and a lean, villainous performance from Tom Cruise, Collateral is a stylish and compelling noir thriller." On Metacritic, the film had an average score of 71 out of 100, based on 41 reviews. Tom Cruise went on to garner critical acclaim, while Foxx received several award nominations. Richard Roeper placed Collateral as his 10th favorite film of 2004. The film was voted as the 9th best film set in Los Angeles in the last 25 years by a group of Los Angeles Times writers and editors with two criteria: "The movie had to communicate some inherent truth about the L.A. experience, and only one film per director was allowed on the list". The film opened on August 6, 2004, in 3,188 theaters in the United States and Canada and grossed approximately $24.7 million on its opening weekend, ranking #1 at the box office. It remained in theaters for 14 weeks and eventually grossed $101,005,703 in the U.S. and Canada. In other countries it grossed a total of $116,758,588 for a total worldwide gross of $217,764,291. Collateral got a VHS and DVD release on December 14, 2004, in widescreen-only on both formats. ^ a b "Collateral (2004)". Box Office Mojo. IMDb. Retrieved October 10, 2009. ^ Ebert, Roger. "Collateral Movie Review & Film Summary (2004): Roger Ebert". www.rogerebert.com. ^ "Louis Leterrier Interviewed by IGN, by Chris Carle - ''After Carle asks Leterrier about the future of the Transporter franchise, Leterrier explains that if the Transporter franchise fails that Frank Martin "will just cameo in movies", mentioning Statham's cameo appearance in Collateral as having been him reprising his role as Frank Martin.''". Filmforce.ign.com. Retrieved April 17, 2019. ^ Cath, le Couteur; Stuart, Beattie. "Independent Filmmakers Network : Shooting People". shootingpeople.org. Retrieved August 18, 2018. ^ Sanders, Steven (2014). Michael Mann - Cinema and Television: Interviews, 1980-2012. Edinburgh University Press. p. 106. ISBN 9780748693559. ^ Jagernauth, Kevin (September 26, 2014). "Trivia: Michael Mann Originally Developed 'Collateral' As A Movie For Adam Sandler And Russell Crowe". IndieWire. Retrieved August 18, 2018. ^ Sanders, Steven (2014). Michael Mann - Cinema and Television: Interviews, 1980-2012. Edinburgh University Press. p. 107. ISBN 9780748693559. ^ "Miami Vice in HD". DigitalContentProducer.com. Retrieved October 10, 2009. ^ Holben, Jay. "American Cinematographer: Collateral". theasc.com. Retrieved August 18, 2018. ^ Andrew, Sarris (August 16, 2004). "Michael Mann's Collateral Cruises L.A.'s Dark Side". Observer. Retrieved August 18, 2018. ^ "Collateral:Original Motion Picture Soundtrack". UME:Universal Music Enterprises. Retrieved February 1, 2014. ^ "Collateral". Rotten Tomatoes. Flixter. Retrieved October 10, 2009. ^ "Collateral". Metacritic. CBS Interactive. Retrieved October 10, 2009. ^ Boucher, Geoff (August 31, 2008). "The 25 best L.A. films of the last 25 years". Los Angeles Times. Retrieved October 10, 2009. ^ "Collateral (2004) – Weekend Box Office". Box Office Mojo. IMDb. Retrieved October 10, 2009. This page was last edited on 17 April 2019, at 17:37 (UTC).